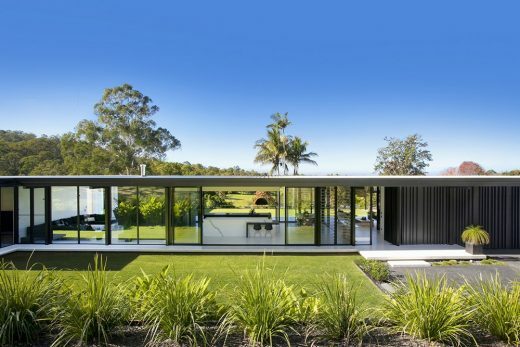 Jewel is inspired by the crystalline volcanic hook that forms the underlying structure at the coastline and in particular, the Gold Coast’s iconic hinterland. 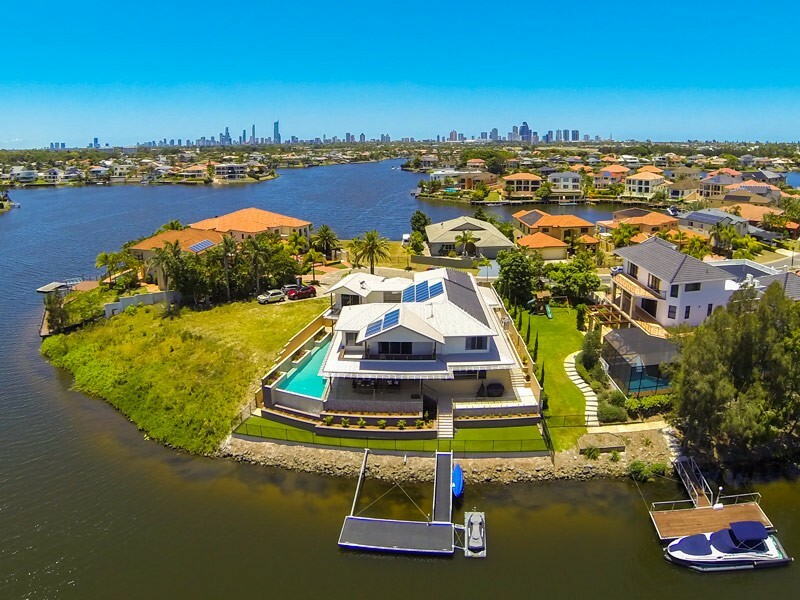 Jewel makes evident the geomorphology of the Gold Coast, while clearly articulating is response to the regions subtropical climate. The building employs sophisticated facade technologies to ensure shading from sun and shelter from the wind, delivering a five star green star building, that is as dramatic as it is sustainable. 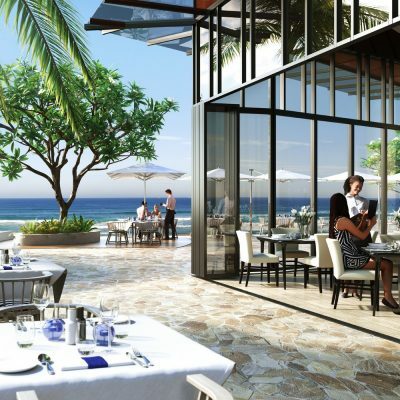 Jewel consists of three towers addressing over 110 metres of beach frontage, offering unparalleled views of the Pacific Ocean. At the heart of this development is the 47 level hotel tower featuring 341 suites and residential apartments atop a three level podium. The podium includes conference facilities, food and beverage outlets; retail and resort amenities commensurate with a world class hotel. A 41 level luxury residential tower and 34 level premium residential tower complete the scheme. 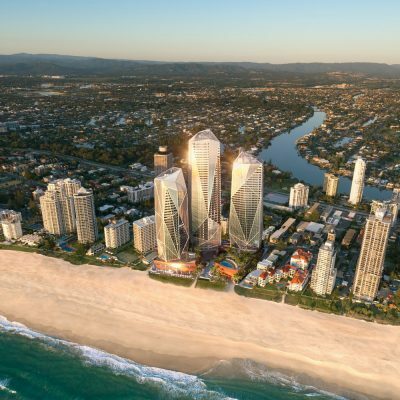 The Jewel will be Australia’s largest beachfront mixed-use development and the first absolute beach front development on the Gold Coast in more than 30 years. 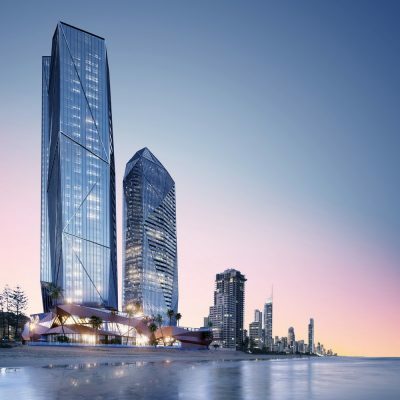 The luxury development is located on Old Burleigh Road in Broadbeach, the three-tower development will include a three-level podium, a six-star hotel comprising 171 suites and 512 one, two and three-bedroom luxury apartments and premium residences. The development will feature three levels of basement parking to accommodate 816 cars. Construction commenced March 2015 with an anticipated completion 2018. The building has been designed to achieve a 5 star green star rating which is consistent with the upper end of development proposals that have been lodged on the Gold Coast, however this is merely a beginning. WANDA’s commitment to environmental, social and cultural sustainability is self evident in all areas of the design of this project. 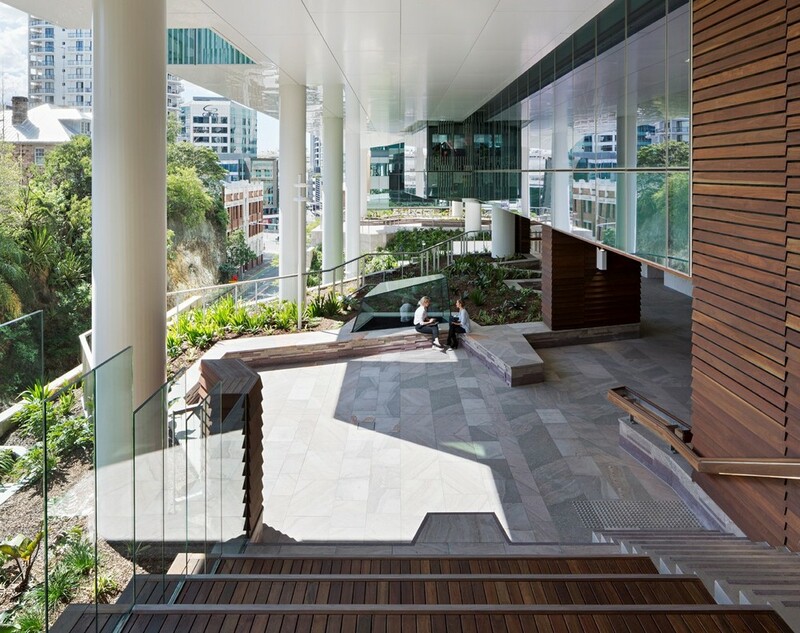 The reinstatement of greater than 100% landscape cover in a dense mixed use urban development is a singularly unique property of this project, through the use of extensive podium landscaping, rooftop landscaping and building spine landscaping. The building intends to achieve at least the original quantum of biomass that would have been found on this site prior to settlement. 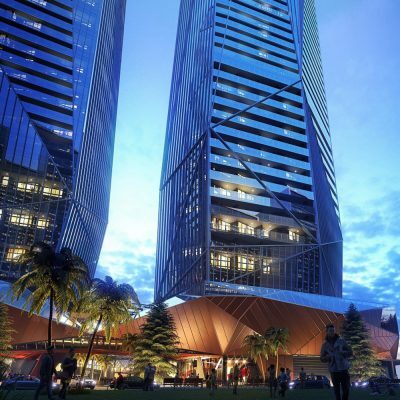 In addition, the extraordinary level of diversity of land uses including the restaurants, bars, retail, hotel, serviced apartments, residential apartments, convention facilities, day spas, beach clubs, swimming pools, etc mean that the project will appeal to a wide diversity of age groups, demographics and people of wide raging geographic origins. 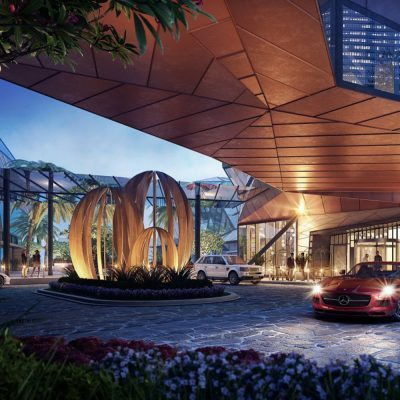 Within the site, holiday makers, residents and locals will share world class facilities with a high profile international 5 star hotel operator overseeing the maintenance of standards and the delivery of services. In addition to the environmental sustainability and social sustainability, the proposal also has a generous cultural sustainability program with extensive use of public and private artworks to animate and inform the public domain. Once constructed, Jewel will be one of the city’s most sustainable developments and a model development for the city. One of the principle notions guiding the design of the Jewel development is an increase in biomass beyond what would have originally been found in the pre-settlement condition of the site. One of the initial collaborators on this project, Dr Ken Yeang, has propounded the theory that to address the impact of human activity on the landscape and on our biodiversity that it is necessary to reinstate (at a minimum) original bio mass that has been sacrificed in order to facilitate development. Jewel is a serious attempt to try to reach this goal. The heavily planted ground plains, the extensively planted podiums, planted rooftops and vegetated building spines mean that in time the quantum of biomaterial on site will be greater than that found prior to European settlement. In addition, the applicants seek to make generous and meaningful contributions to the greening of the urban fabric around the perimeters of the site and indeed all along Wharf Road up to Neddy Harper Park. Sustainability and accountability are key parts of the WANDA development ethos as has been clearly reflected in the nature of this development. The developer is extremely aware of this important position at the interface between the ocean and its beachfront and the urban fabric. Being such a key location, it’s taken the opportunity to invite some very unique and innovative architectural, environmental and landscape solutions in order to create a development of significantly higher standard that would ordinarily be expected in such a location. The development is sensitive, not only to the individuals who dwell within the development, but also to the pedestrians who circle around it, are welcomed in to it, and the large number of beach goers who’ll enjoy recreating on the beachfront in front of it. 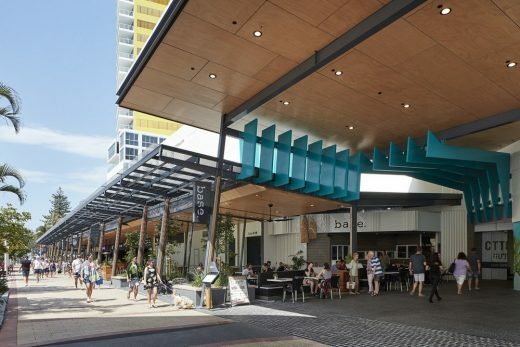 Importantly the project will provide welcome opportunities for rest and refreshment for people travelling the three kilometres between Broadbeach and Surfers Paradise along the Gold Coast Oceanway. A’ Award and Competitions are happy to share that the project Jewel by Developer Wanda Group, Architect	DBI, Interior Design	DBI Design, Builder	Multiplex, Structural Engineer	Arcadis, Acoustic Engineer	Acoustic Logic, Electrical Engineer	Blue Star, Air Quality	Ellis Air, Fire Services	Premier Fire and has been granted the prestigious Golden A’ Design Award in Architecture, Building and Structure Design Category chosen as one of the winners by the international judges of the A’ Design Awards & Competitions amidst numerous projects.